While a buck a month isn’t going to break the bank, it’s a buck that I wasn’t planning on spending. 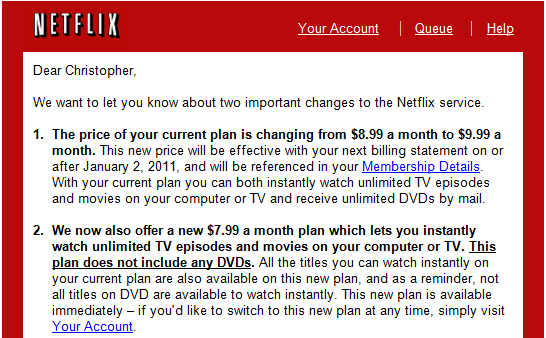 While this also won’t cause me to cancel my account, I’m not happy with the extra out-go being taken from my income. Apparently, the cost of managing their DVD inventory is getting to be a bit on the costly side. The company also introduced a new streaming only plan that allows anyone with an internet connection to instantly watch movies and TV shows at a very affordable $7.99 a month. If you’ve got a decent pipe coming into your house, and don’t mind not being able to put your hand on a DVD, this may be a huge winner for you. Additional adjustments to their pricing plans can be seen below.